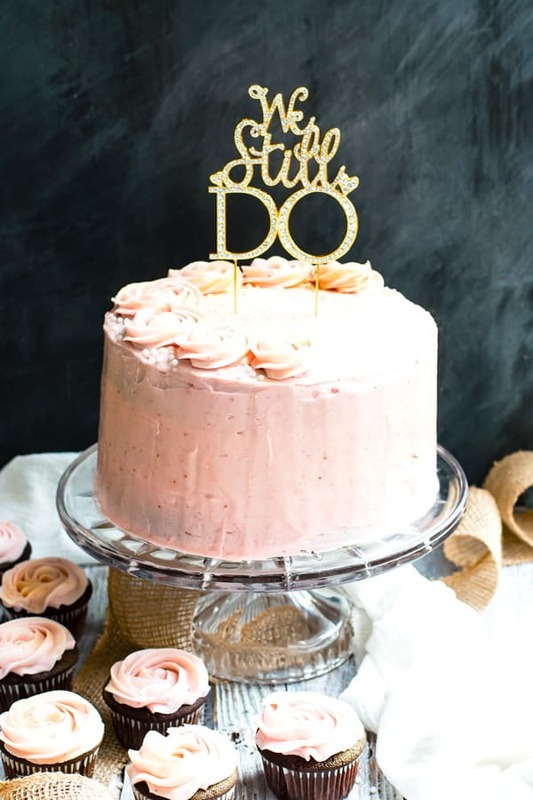 Chocolate cake with strawberry frosting is the perfect anniversary cake to celebrate marriage! 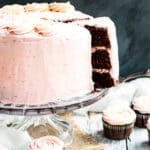 This gluten free chocolate cake is super rich and topped with a fresh strawberry cream cheese frosting that will make you want to lick your plate. 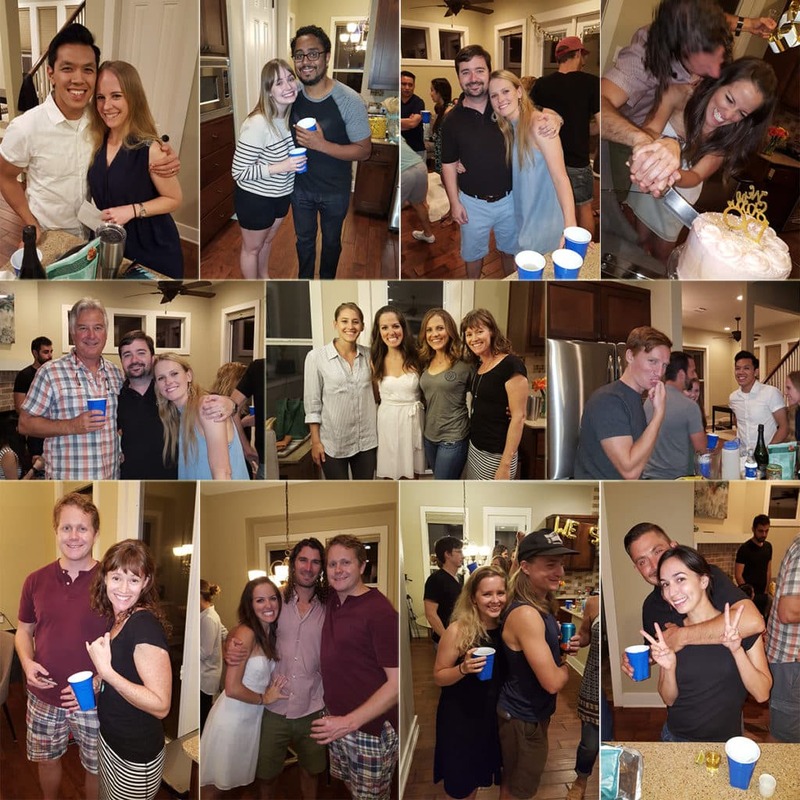 We say this just about every time, but for realz… This party was by FAR one of our favorites. Cohl and I celebrated 5 years of marriage on June 9, 2017. 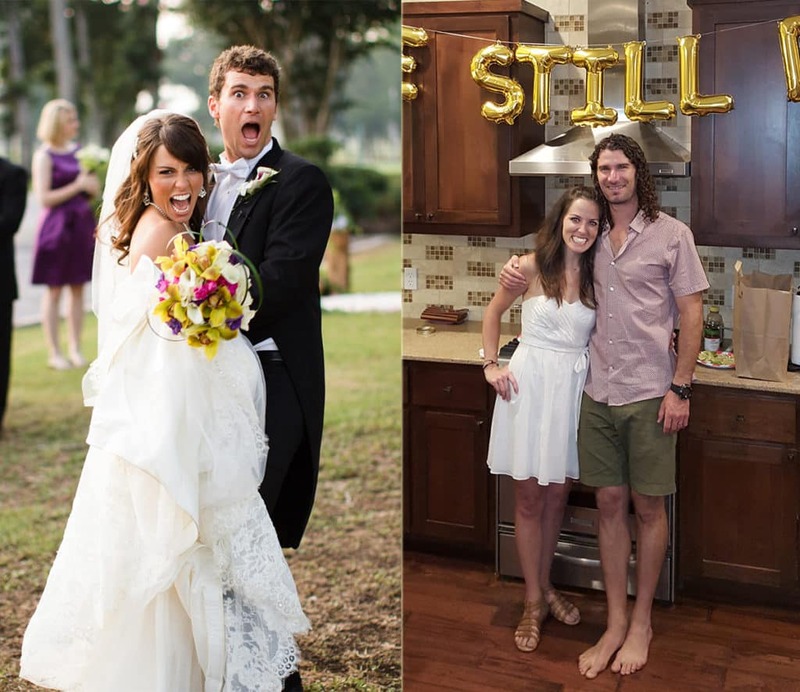 Since we were gearing up for his Texas Water Safari race, our actual anniversary was anything but romantic. It consisted primarily of making Academy and grocery store trips to ensure the boys had everything they would need for their 260-mile canoe race. We love to throw house parties, and at most parties, I tend to make a humongous cake to celebrate whatever life event we’re gathering for together. For this particular occasion, our 5th Anniversary cake was a rich chocolate cake with strawberry frosting. This chocolate cake with strawberry frosting was absolutely perfect for our anniversary cake. Originally I wanted to do a very feminine, classic white vanilla cake with a beautiful white buttercream frosting. When I asked Cohl what kind of cake he wanted for our anniversary he quickly replied, “Chocolate!” <– Not even sure why I ask anymore?! I get this answer every single time! 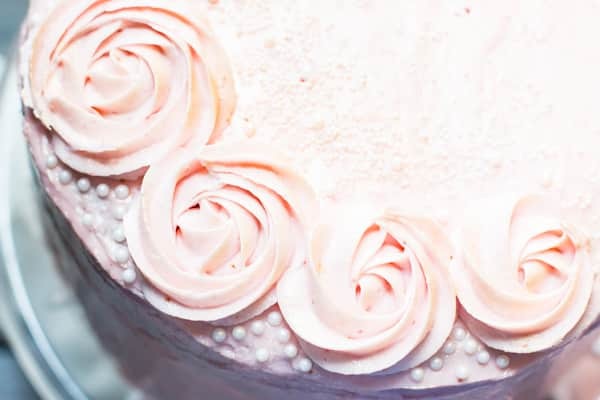 In an effort to give Cohl the chocolate cake he desired and still make the cake seem romantic, I decided to decorate it with a fresh strawberry cream cheese frosting. The flavor combination was out of this world!! Now let me tell you about this strawberry frosting. It is lick-your-plate good and made with FRESH strawberries. Yup, you heard me right!! No fake strawberry flavors, no powdering of dried strawberries. All you have to do is puree, simmer, and mix! Voila!! You have the most incredible strawberry frosting to go on top of that rich and decadent chocolate cake. To my love… I knew when I first laid eyes on you that you were going to be trouble… in a very, very good way. You challenge me, uplift me, and love me in a way that no one else can. I’ll love you forever and always, Cohl!! To 50+ more years of a beautiful life together! I will love you forever and always, Cohl!! To 50+ more years of a beautiful life together! Thank you, thank you, thank you! !… For all of your love, your continued support, and for all of the amazingly fun times we have had/will have together. We love each and every one of you so very much! This chocolate cake with strawberry frosting was the perfect anniversary cake for us to celebrate 5 years of marriage with family and friends! Combine butter and sugar in the bowl of a stand mixer and cream on medium high until light and fluffy. About 2-3 minutes. Add in eggs, one at a time, and cream after each addition until well combined. Combine baking flour, cocoa powder, baking soda and salt in a separate bowl and toss to combine. Alternatively add in dry mixture and buttermilk, starting and ending with the dry mixture. Grease 2 9-inch round baking pans with butter or non-stick cooking spray and divide batter evenly among them. Place strawberries in a blender or high speed mixer and puree until completely smooth. You should have about 1 cup of strawberry puree. Place strawberry puree into a small saucepan and simmer for 15-20 minutes, or until puree has reduced by half. Let strawberry sauce cool to room temperature before proceeding. Combine 4 Tbsp butter and 4 Tbsp cream cheese in the bowl of an electric mixer. Cream until well mixed. Add 2 cups powdered sugar and mix until combined. Add vanilla and strawberry sauce and mix well. Add 2 more cups of powdered sugar and mix until smooth. Remove cooked cakes from pans to allow for quicker cooling once they have been out of the oven for at least 10 minutes. To assemble cake, place a dollop of frosting on the plate you are placing it on. Put the first layer down. Spread about 1/3 of the frosting mixture over the first layer. Add 3-4 toothpicks to allow for greater stability. Place second cake layer on top of the first frosted layer. Completely frost the top and sides of the cake with the remaining frosting. Refrigerate cake between servings. Enjoy! 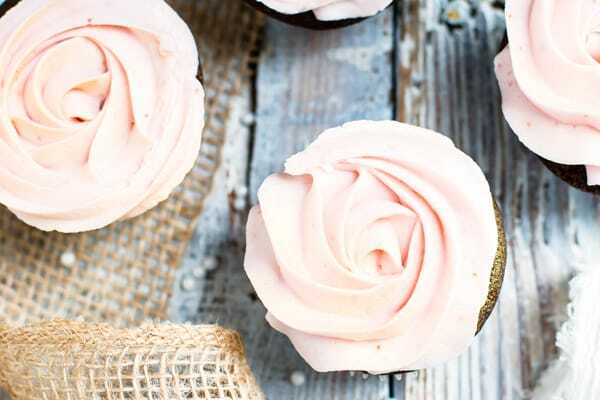 *If you would like to make cupcakes: Divide the batter among 24 regular-sized cupcake cavities with cupcake liners in them and bake for 23-25 minutes in a 350 degree oven. **For the cake you see pictured, I multiplied both the chocolate cake and strawberry frosting by 1.5 times to get a 3-layered cake. 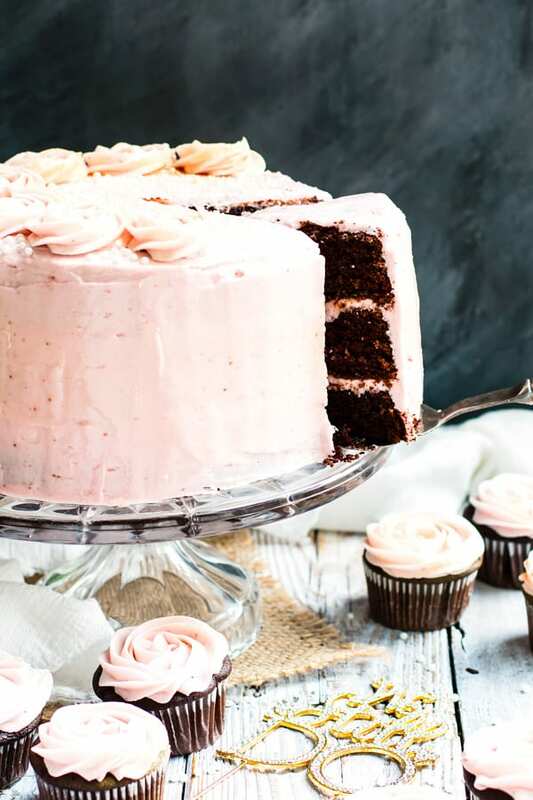 Want more recipes like this Chocolate Cake with Strawberry Frosting? 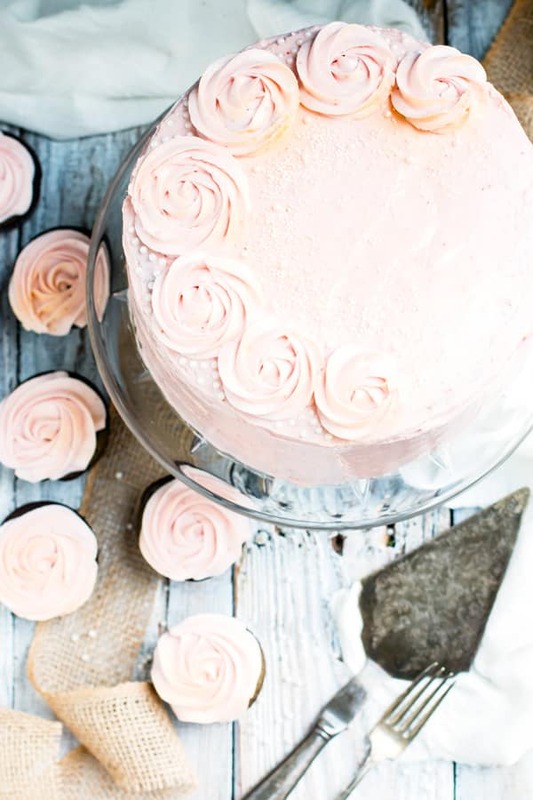 This strawberry frosting sounds seriously insanely delicious! Congratulations on 5 years! Thanks so much, Melissa!! The frosting was ah-maaazing!! This cake looks amazing–I’m sure my husband will love it. i do not bake gluten-free–do you use the same amount of regular flour as the gluten-free flour in the recipe?? Thanks, Sue!! Yes! Just use the exact same amount of regular flour and it should turn out great 🙂 Hope your husband loves it! Is the frosting stable enough to use for decorations/piping? Hi Natalie! It might be slightly too runny, but you can always add a touch more powdered sugar to stiffen it up. I would suggest adding 1/4 cup increments until it looks to be the right consistency!